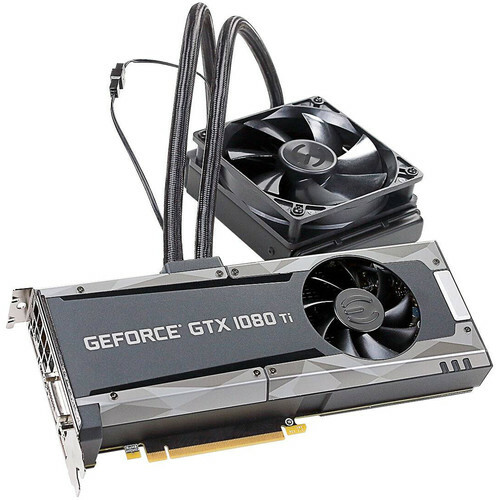 Based on NVIDIA's Pascal architecture and designed to handle the graphical demands of 4K gaming, the EVGA GeForce GTX 1080 Ti SC2 HYBRID GAMING Graphics Card provides major improvements in performance, memory bandwidth, and power efficiency over its predecessor, the high-performance Maxwell architecture. It also introduces innovative graphics features and technologies that redefine the computer as the platform for playing AAA games and taking full advantage of virtual reality via NVIDIA VRWorks. The front panel of the card features a variety of outputs. There are three DisplayPort 1.4 outputs, an HDMI 2.0b output, and a DVI-D Dual-Link output. The GTX 1080 Ti is not just about high-resolution gaming. Computationally intensive programs can utilize the GPU's 3584 cores to accelerate tasks using CUDA or other APIs. This GPU has an adjustable white LED that can be controlled in EVGA Precision X OC. For cooling, EVGA features a 120mm fan and radiator as well as a closed loop liquid cooling system. With 9 iCX thermal sensors, the GPU and PWR components determine the pump and fan speeds. You can monitor each sensors in real time, thanks to EVGA Precision XOC. The copper base can efficiently transfer heat to the circulation pump. Since it is a closed loop system, it does not require additional maintenance or assembly. NVIDIA's SLI HB bridge doubles the available transfer bandwidth compared to the NVIDIA Maxwell architecture. Delivering smooth gameplay, it's an effective way to enjoy surround gaming and it's only compatible with the GeForce GTX 1070, 1080, 1080 Ti, and TITAN X graphics cards. Box Dimensions (LxWxH) 14.6 x 6.7 x 6.3"
GeForce GTX 1080 Ti SC2 HYBRID GAMING Graphics Card is rated 4.6 out of 5 by 9. Rated 3 out of 5 by Sean from Low temperatures but not all that quiet While the temperatures are great, the pump itself runs at 100% speed at all times, with no way to control it by default. It is by far the loudest thing in my case and very irritating. The fan that comes in the box for the radiator has a 3 pin plug. These cards do not have much overclocking headroom without modding anyway, so I would think that the point of a hybrid card is that it may run quiet under load as compared to entirely air-cooled cards. If you're like me and you want a dead silent system, you'll have to take apart the card and order an adapter in order to control the pump and reduce the noise. All in all, unless you're willing to mod the card to make it silent, I don't see much point in purchasing this over a well-designed air cooler. Rated 5 out of 5 by Yao from very good for 4-way sli keep the temperature at 50C when four stacked cards running at 100%. Non-water-cooled cards can be very problematic for this setting. Rated 5 out of 5 by Aslan S. from Nice for Adobe Premier CC 2017 The speed is great for playing RED RAW files. You need good RAID or HDD. Rated 4 out of 5 by Anonymous from Max 40c These are great for CG rendering with Octane, Redshift, V-Ray etc. The temperature never goes above 40c even with three packed next to each other. But I'm deducting one star for the scummy annoying plastic film that they're wrapped in when new. It's hard to peel off and leaves a residue. I had to carefully clean some of it off with alcohol. Rated 4 out of 5 by Claus from Quite but lack luster I bought two of these to do rendering. Bench test with Octane they are hitting the bottom end of the scoring range. I expected more but they work good and stay cool so a few percentage points slower is Ok if these last. P.S. They do work well with Blender, BMW27 test = 15 seconds! Rated 5 out of 5 by Richard from FAST & COOL Amazing card. I'd buy it again! I run it at full load 24 hours a day for 2 weeks, no problem! It stays really quiet and cool, never exceed 60 degrees. Rated 5 out of 5 by Richard from Quiet and cool. GREAT! Wonderful water cooled GPU. EVGA did a great job, making this card runs quiet and cool under full load 24/7. Temperature never exceed 60. Has anyone put this version of the card in a HP z840? I want to fit 4 of these into a Case, do you have any recommendation? Thanks! Asked by: Carlos Go-niji L.
Yeesh, even if you could find the vent space for the rads, that's 8 tubes going through your case. I reeaallly would recommend just setting up a custom loop at that point. If for nothing else than air flow and cleanliness.